Cookies are great. There are all different sorts of cookies, drop, rolled, icebox, boxed, homemade, mixes, plus just about any flavour you can imagine. There is cookie dough ice cream (chocolate chip AND caramel peanut butter… oh, the joys of summer! ), Christmas cookies, gingerbread houses, there’s even a cookie MONSTER! Some are simple to make, others take awhile. But there is one thing (maybe two…) that really bug me about cookies. First and foremost: When homemade cookies try to be perfectly circular. Don’t even. They’re homemade – that means they should have some character and at least try to look homemade. 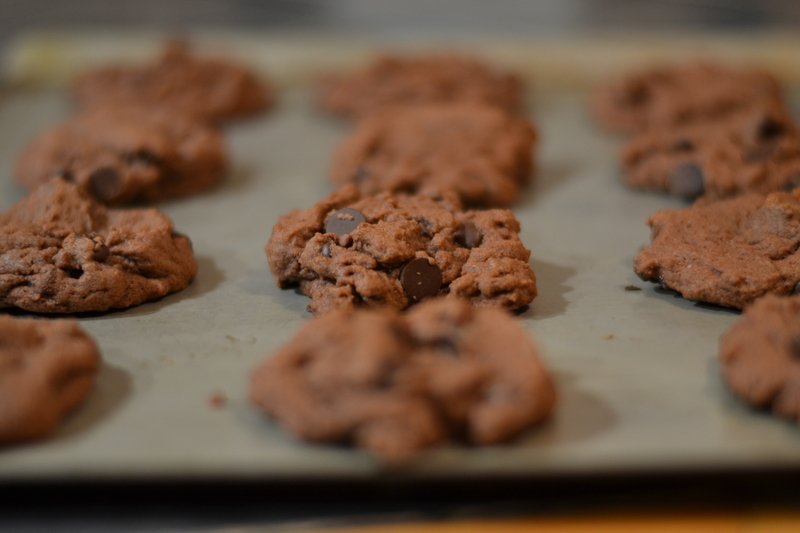 Secondly: 2 hours old cookies. I said I love cookies. But I’d much rather bake them and eat the dough, than eat the cookies themselves, especially if they’re not right out of the oven. But that’s just me. I know lots of people who absolutely adore cookies – any kind, anytime, anywhere. I made 6 dozen cookies in two days, and they were almost completely gone the third day (of course, that is in a household with 6 males…). There are a few kinds that I love though. Just a few. 🙂 Oatmeal raisin. Now, people say these are grandmother cookies (namely my hubby), but they have GOT to be the best cookies out there – especially right out of the oven. Molasses. My father and our pastor’s wife both make different kinds of molasses cookies, one type is really soft and the others really chewy, but they. are. both. SO. good! Drop shortbread. These are normally Christmas cookies in my house. They’re oh-so very buttery and we put gumdrops on top (but I take those off and let my mother eat them (gumdrops are gross) haha). These are probably the only cookie that I could eat dozens of, whether they’re just out of the oven, or days old. The last one on my favourites list: Date. Oh-so-good. Oatmeal cookies with cooked dates in the middle. These things looked and tasted absolutely gross to me until I was about 16, but man! Now they are soooo good! And – peanut butter cookies. Yum. I’ll cook all of these up sometime soon (and more) and share with you. 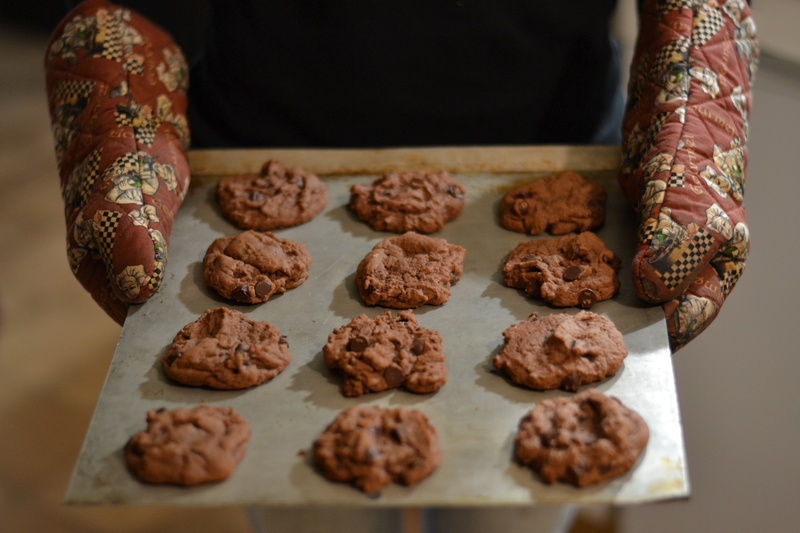 But for now, how about some Double Chocolate Chip cookies? Preheat oven to 350. Cream together the margarine and sugars. Add eggs and vanilla and mix. Add pudding, flour, soda, and salt. Mix until smooth. Stir in chocolate chips. Drop onto ungreased baking sheets and bake for 10-12 minutes (i do 11, but that’s just our oven…). Let cool for a few minutes on sheets, then transfer onto a wire rack. Enjoy with a glass of milk! 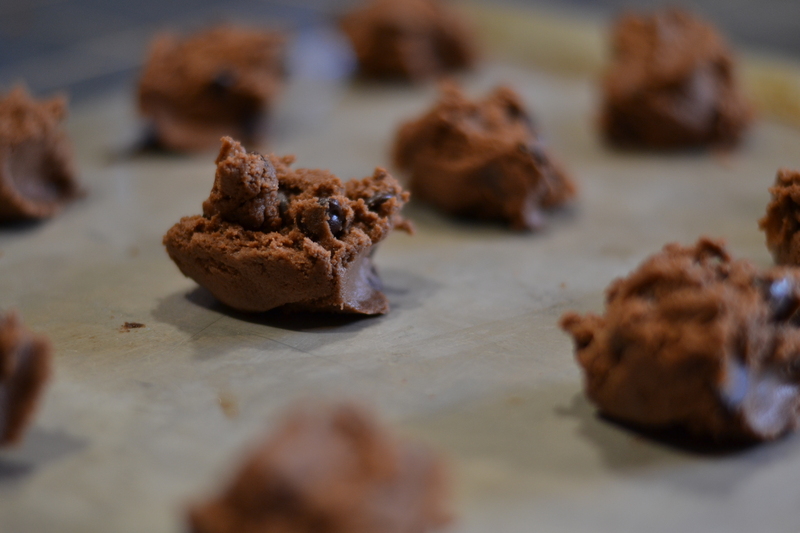 Oh cookies… I absolutely love making them. They’re great to give away too. My favourite baking style for these tasty rounds has got to be drops. They’re so much quicker than rolling, etc. You have GOT to try out our chocolate chip cookie recipe, and my oatmeal, butterscotch, skor! They’re on their way to this blog… sometime soon! What’s you favourite cookie? Have any similar (or dissimilar) gripes?